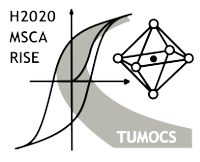 The meeting will consist of two parts: TUMOCS project meeting (28th of August) and International Workshop on Metastable Perovskite Multiferroics (29th of August). To present and discuss the most recent results on preparation, optimization and characterization of new promising perovskite multiferroics based on high-pressure metastable phases. To consider and plan future collaborations within and beyond the project TUMOCS.